Round up your ghosts and goblins, your superheroes and ballerinas and come on out to Historic Downtown Frankfort for a Family Friendly Halloween Event. Beginning at 10 am there will be a costume parade and Trunk or Treating sponsored by our Frankfort Police Department. Then at 10:30, the little ones can pick up their ghost hunting instruction on Breidert Green. They will visit our shop windows to find the hidden Halloween fun and receive another treat! There will be a DJ as well as Hay Rides. 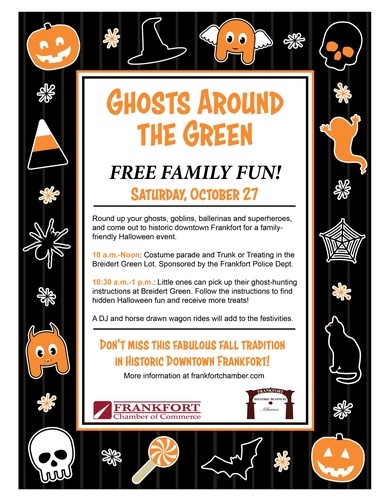 Don't miss the opportunity for fun, fall tradition in Historic Downtown Frankfort!